Should this item be refrigerated after opening? According to the vendor, this product should be refrigerated after opening, and for best results, used within one year. This product tasted like sugar and seemed to lack flavor. Did I use it incorrectly? For best results, it is recommended to shake this bottle of syrup before using. Capture the taste of summer with the sweet, refreshing flavor of Fox's blue raspberry snow cone syrup! 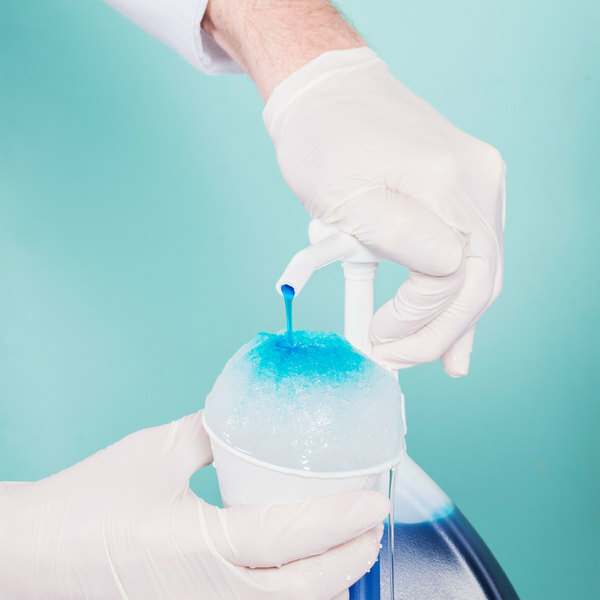 The fruity blue raspberry flavor of the syrup combines with the icy texture of the snow cone to create an irresistible frozen summer treat that your customers will love. A corporation specializing in irresistible ice cream toppings, sweet syrups, and fizzy soda mixes for over 100 years, H. Fox & Company takes great pride in their products. Snow cones are the perfect treat to help all of your patrons beat the heat. 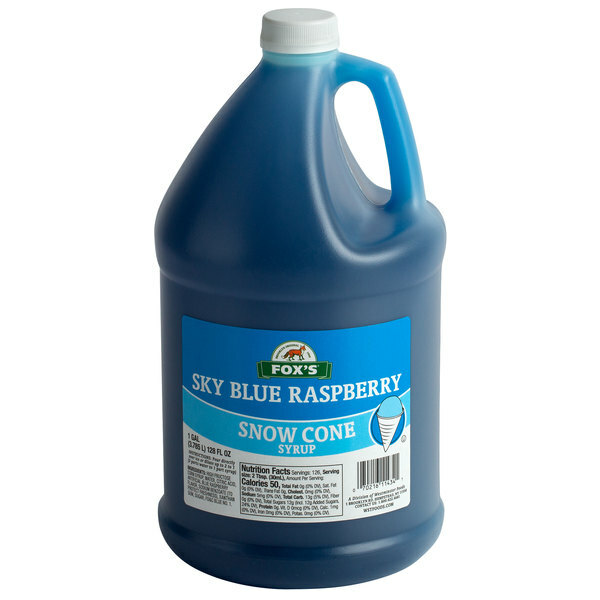 Featuring a classic raspberry flavor and a visually appealing, vibrant blue color, this snow cone syrup can be used to enhance the menu at any concession stand, fair, or ice cream shop. With 96 servings of snow cone syrup per container, your business will be in good supply. Each gallon of snow cone syrup is made with the finest ingredients to create the most authentic mouth-watering flavors. This snow cone syrup is traditionally poured directly over ice or mixed at a ratio of 2 parts water to 1 part syrup. Fox's blue raspberry has a little stronger flavor while being a little less sweet than the other brand. This syrup dilutes and therefore makes a ton. It covers evenly and does not sink all the way to the bottom making it a top choice! perfect flavor of blue raspberry ! has the perfect amount of everything in it and has a very great taste. it is not too sweet but is also not plain. 100% recommended. A great brand of snow cone syrup at a really nice price. The blue raspberry is great and a fan favorite for sure. A nice sweet taste. Our guests second favorite flavor behind cherry. How can you beat this price for a gallon of tasty high quality syrup? Great stuff, highly recommend! This tastes like other blue raspberry flavored products. It is very good as a snow cone flavoring. It is one of the most popular ones. This syrup tastes very good and our customers love it. So far I have purchased a few of these already. Good price and fast delivery. The Fox's Sky Blue Raspberry Snow Cone Syrup is probably great on snow cones. But you can also use this syrup to flavor drinks or put over ice cream This is a very versatile product that we use over and over in our food truck business. This is a great brand of snow cone syrup. It is thicker and has a great flavor and great color! It came in a fashonable time and the package was great! No damage! Shipping was quicker than exspected! Good flavor. If you are looking for an alternative to the popular brands of shaved ice syrup then this isa good choice. Not too sweet or heavy. Great value for the price. We have a fun farm and only use this name brand syrup for our snow cones. Everybody has loved every flavor. Will forbsyre be trying different fkabirs when we run out of what we currently have. This flavor is a classic and one of our best sellers. Kids go crazy over the famous "blue drink" and come back for it every weekend. We had been looking for a reasonable priced snow cone syrup that would compliment our snow cone machine. This was the right choice. It was reasonable and the quality and taste was very good. Would buy again even though shipping costs is slightly high. I love this syrup. The customers love it as well. We put a pump on it and it easily squirts out onto the ice in the cup. It's not too thick and not too thin either. Blue Raspberry syrup is an all-time favorite snow cone flavor for the kids that visit our pumpkin patch. It has a great flavor and makes a pretty snow cone. The syrup is delicious, it came as described on the website. the packaging was fine but they just have to make sure the cap is firmly tighten, to avoid a shipping mess. Two of my bottles had to be replaced because of loose caps. The Customer rep. was excellent and I am very happy. We purchase this snow cone syrup for our daughters birthday party and it was great! Great price, great taste and kid approved! Very Pleased with this purchase. LOVE THE FLAVOR, ITS VERY BOLD, AND THIS IS ACTUALLY A VERY POPULAR FLAVOR AMONGST MY CUSTOMERS AND I WOULD RECOMMEND IT ANYONE FOR PURCHASE. Great flavor, doesn't require a lot of syrup to notice color or taste. Not too sweet nor sticky. Would definitely recommend! Ordered a case, one of the gallons top cracked.... customer service responded immediately! Love the WEBstaurant Store and will continue to be a loyal customer! This is a nice high quality product for snow cones. The flavor and color are both distinct. I love the resealable tops, since this stuff can get everywhere! Blue raspberry is great. Great product for a Sno Cone machine! And it's a lot cheaper than other products I have used in the past! Each flavor is strong and not watered down like a lot of other cone syrups are. This is a great deal for the money! It is very easy to use but make sure you buy the pumps! Trying to pour this stuff directly onto sno cones makes for a huge soggy mess! This is great product I could not say anything more about this. I love all the flavors. The price is just right and I will buy more.